The shebab were but one element of what became, for a time, an exceptionally unified, clandestine and well-organized campaign of national resistance. The atfal al hijara - children of the stones – were only the most visible symbol of the firstintifada, or uprising: the vanguard of a war of liberation that cut across class, religion, and political affiliation. The people’s leaders in the Palestine Liberation Organization were in exile, in Tunis and Algiers, but quickly an anonymous local command emerged. Unambiguous directives — demonstration Noon today, at Manara; general strike tomorrow, no business may open — appeared overnight, scrawled on the camp walls, scattered in unattributed fliers, or shouted out by Palestinian fruit market vendors amid their cacophonous hawking of watermelons and figs. Chicken coops and rabbit dens rose up in the courtyards of the wealthy and the rooftops of the refugee camps. Dozens of rabbits quickly became thousands; secret food committees distributed eggs and fresh meat throughout the cities and villages. Squash and tomatoes sprouted in forbidden “victory gardens.” Rice, lentils, potatoes and olive oil were hidden in neighborhood caches, then distributed in the small hours to the doorsteps of needy families, breaking the military curfews. Education was improvised: As the authorities shut schools and universities, teachers secretly met their students in parents’ living rooms, behind hedges, under olive trees, and even, sometimes, in caves. In Al Amari refugee camp beside Ramallah, local leaders formed solidarity committees. Clandestine food deliveries arrived by truck late at night, dropped off quickly in the back of a volunteer’s home and passed along in a house-to house chain by the distribution committee. The neighborhood protection committee included children who shouted jeesh! (army!) at the sight of entering jeeps or soldiers, and women who relayed the warnings by banging rocks on a successon of resonating electrical poles. Secret ballots to elect board members to the popular committees traveled from family to family, hidden in the folds of women’s clothing. Local mothers in the social committee organized visits to the families of youths arrested and held under administrative detention. In the face of this the military authorities intensified their crackdown. Commanders seized a four-story stone building at the entrance to Al Amari, affording a view of the entire camp. Snipers perched on the roof as jeeps and armored trucks entered the camp and soldiers spilled out for foot patrols through the veins of Al Amari. Soldiers of the day recall three basic tasks ordered from on high: remove all Palestinian flags and obliterate graffiti; find and detain suspected organizers and militants; chase the children and young men throwing stones. Job one was obliterating any expression of nationalist sentiment, especially the banners of green, black, and white, with a red triangle pointing left to right: The Palestinian flag. Each morning soldiers would find the flags flapping from telephone or electrical poles. They’d pound on a few doors, order the men out, and command them to select a volunteer to climb up and take down the banned national colors. They ordered the women to remove the slogans and directives splashed nightly on the camp walls. Graffiti removal was so common that some families had a bucket of white paint by the door. At night, the women would sew more flags — sometimes stitching the banner of Palestine right into their clothing — and the next day the ritual would begin again. Israeli authorities had initially dismissed the Intifada as a series of temporary local disturbances. “Our goal is to put down the uprising, to reinstate law and order, and to return life to normal,” Israeli commander Amram Mitzna wrote to his soldiers in the Central Command in 1988. When normal life did not return, Defense Minister Yitzhak Rabin instituted a policy of “force, might, and beatings,” which included, it was revealed later, permission granted to IDF soldiers to break the bones of stone throwers. But the military’s belief that the iron fist would quell the demonstrations proved unfounded. Instead, it sparked more. At Al Amari, women gathered rocks from nearby hillsides and ferried them onto waiting vehicles. Clandestine search parties scoured the dumps and hillsides for discarded tires. Volunteers filled plastic jugs with petrol, carrying them swiftly and secretly back to the camp. Sometimes the shebab hurled stones, or, far less frequently, a Molotov cocktail, at a settler driving through town. But the soldiers were the main targets. The confrontations at Al Amari began in the afternoons, often after Friday prayer. Young men and boys would drag heavy stones or concrete blocks across the road, to keep the jeeps from entering the camps. They’d adjust their homemade leather rock launchers and slingshots — eight-year-old Ramzi made one from the laces and tongue of an old shoe — or rotate their arms like baseball pitchers warming up in the bullpen. To protect their identity, the older shebab wrapped their faces in checkered keffiyas. They eyed the soldiers, perhaps 80 or 100 yards away, at the ground floor of the four-story stone building. Then they poured the gasoline and lit the match. From the blazing tires, twisting black colums rose above the camp, signaling the start of another day of battle. 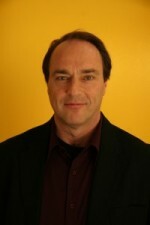 Playing the role of David was Ramzi himself. 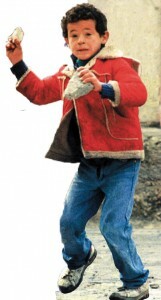 During a clash on a cold winter day in 1988, the eight-year-old became a visual symbol of the uprising. He wore blue jeans and tennis shoes; his red jacket with the faux-fur collar was flying open. He faced an Israeli jeep. In his left hand he clutched a rock nearly half the size of his head. His raised right arm was drawn behind him, the hand wrapped around a stone. Ramzi’s eyes conveyed a mixture of anger, fear, and resolve. His arched eyebrows seemed to say, Here we are. His left foot was planted, and he was stepping forward with his right. In one more second, the stone would fly. In that instant, a photojournalist – it’s still unclear who snapped a picture. At first, it ran in the local papers in Israel; a day later it ran in the Arabic-language papers, delivered across town by Ramzi and his fellow newsboys; soon it would transmitted to newspapers around the world. The image was later reproduced on posters across Europe, depicting the rage and apparent fearlessness of the children of the stones. It would become perhaps the single most recognized image of the Palestinian intifada. Ramzi had suddenly become a child legend of his people’s uprising. There were times, in full flight from the soldiers, when a strange sense of protection would settle over Ramzi. He could feel his sneakers grabbing the dimples of the tin roof; he could watch his limbs pumping in a perfect rhythm with his panting breath. In moments like these, there wasn’t time to put words to a prayer, but he put out the energy of a fragmented offering: God, I love you, I need you. I need to be alive. There was nothing more in the world that could help him; a bullet would whiz past, and he’d understand his life in terms of centimeters. Oddly, in times like these, he often felt protected: buoyed, lifted, and cared for as he ran and ran, sprinting from rooftop to rooftop, leaping toward an imagined freedom. This is excerpted from ”Uprising,” a chapter in “Children of the Stones” (working title), the new book by Sandy Tolan exploring music, hope, and occupation in Palestine. Publication by Bloomsbury is expected in early 2014.